The British historian James Anthony Froude published The English in the West Indies, or, The Bow of Ulysses in 1888. Written in the form of a travel narrative, the book was a vitriolic attack on Caribbean people, especially those of African and Indian descent. Froude particularly opposed Caribbean demands that locally elected governments replace the Crown Colony system. He argued that Caribbean people were unable to govern themselves, and that this was demonstrated by the history of Haiti after the Haitian Revolution. Cover of John Jacob Thomas’s Froudacity: West Indian Fables Explained. Courtesy National Library of Scotland. The African Obeah, the worship of serpents and trees and stones, after smouldering in all the West Indies in the form of witchcraft and poisoning, had broken out in Hayti in all its old hideousness. Children were sacrificed as in the old days of Moloch and were devoured with horrid ceremony, salted limbs being preserved and sold for the benefit of those who were unable to attend the full solemnities. People in the Caribbean, not surprisingly, intensely disliked Froude’s book. It was met with rebuttals in many Caribbean newspapers, and several writers published longer articles and books refuting its claims. Among these, the most significant was by John Jacob Thomas, a Trinidadian intellectual and school-teacher of African descent who had published The Theory and Practice of Creole Grammar, an early study of Trinidadian Creole, in 1869. Thomas’s Froudacity: West Indian Fables by James Anthony Froude was published in 1889, the year after Froude’s book. It systematically rebutted Froude’s arguments, and mocked his claims that the Caribbean was dominated by obeah. Froudacity begins with a sarcastic précis of Froude’s work that argues that Froude was obsessed with Haiti and did not pay proper attention to the British West Indies. 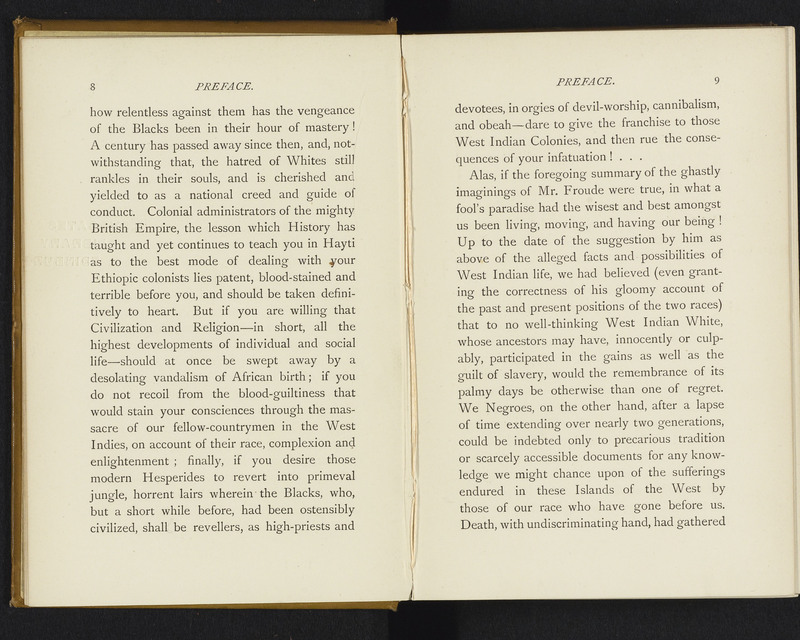 It emphasizes the respectability of Caribbean people, arguing that Froude’s claim that political reform would lead the British colonies to degenerate from being ‘ostensibly civilized’ into ‘revellers … in orgies of devil-worship, cannibalism, and obeah’ was ridiculous. Pages from John Jacob Thomas’s Froudacity. Courtesy National Library of Scotland. Thomas did not defend Caribbean religion, but rather treated Froude’s caricature of it as absurd. His strategy was to prove that Caribbean people deserved political rights because they were no different to British people. This strategy meant that in Froudacity he did not acknowledge the reality of powerful forms of African-derived knowledge and religious practice in the Caribbean, even though in his earlier work on Creole Grammar he had translated phrases related to obeah. Brereton, Bridget. ‘John Jacob Thomas: An Estimate,’ Journal of Caribbean History 8-9(1977). De Barros, Juanita. “‘Race’ and Culture in the Writings of J. J. Thomas,” Journal of Caribbean History 27, no. 1 (1993). Smith, Faith. Creole Recitations: John Jacob Thomas and Colonial Formation in the Late Nineteenth-Century Caribbean. Charlottesville: University of Virginia Press, 2002.